The Alpine Passes Trail strings together many of the most beautiful passes in the Graubunden and Valais Alps in 34 stages. One highlight follows another from the Greina Plateau to the passes and lake landscape at the foot of the Dents du Midi. Hiking over passes is a special discipline with its own devotees. It’s not mountaineers seeking spectacular summit views or the satisfaction of conquering the mountain but hikers driven by curiosity who wend their way up the «Furggeln» or «Bocchette» passes. Because every pass holds the secret of the unknown on the other side. What’s on the map is not enough; the aim is to discover a new world with each valley – and to leave the old one behind. The Alpine Passes Trail strings together many of the most beautiful and impressive passes in the Graubunden and Valais Alps on one continuous route. 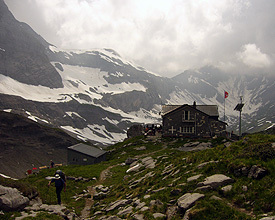 The result is a challenging but fascinating Alpine hiking tour with 34 stages. One highlight follows another, from the Greina Plateau to the passes and lake landscape at the foot of the Dents du Midi. Clearly it’s not likely that all stages will be covered at one time – but it can be hiked in sections. One major advantage of hiking the passes is the opportunity to leave or join the route in any valley between two passes. And once you’ve trodden the entire route – you can claim that you’ve looked deep into the soul of the Graubunden and Valais mountain world.